If you still haven’t been to Paris, I would highly recomend you that you travel there with your lover in Spring time… yes it might sound a bit of a topic… but, oh la la! what a precious city and if on top, you are in love, then is the MOST! My second time in Paris was also many years ago and yes, I was in love and my lover was an American guy and Richard was his name… I will not reveal my secrets here, I will just tell you that Paris is the city of LOVE♥… Aaaaahhhhh l’amour! My third time in Paris took place 9 years ago when my daughter was 3 and of course she enjoyed EuroDisney more than the city. Why am I telling you all these stories? Well, my friend Joan from Foodalogue is virtually travelling through some countries with his Culinary trip around the world and is asking us to join her during the trip with a recipe of that country. Since France is the country where it all started… I’m talking about real cuisine, Gastronomy in capital letters, love for the food, exquisit and succulent dishes, food art… I thought we could meet in Paris and have these Sole Meunière-style with a bottle of Taittinger. Does this sound good to you Joan? This is such a simple recipe, anyone can become a French Chef for one day ;D… get your apron on and follow me to the kitchen! This is one of the best ways to have this fish… trust me… soooooo good! In the pictures you will see only 3 soles but recipe measures are for 4. Searching for other French dishes? Bouillabaisse is my favourite French soup, don’t miss this link! Foie (Goose liver) is used in many French dishes… what about a French and Spanish brotherhood? 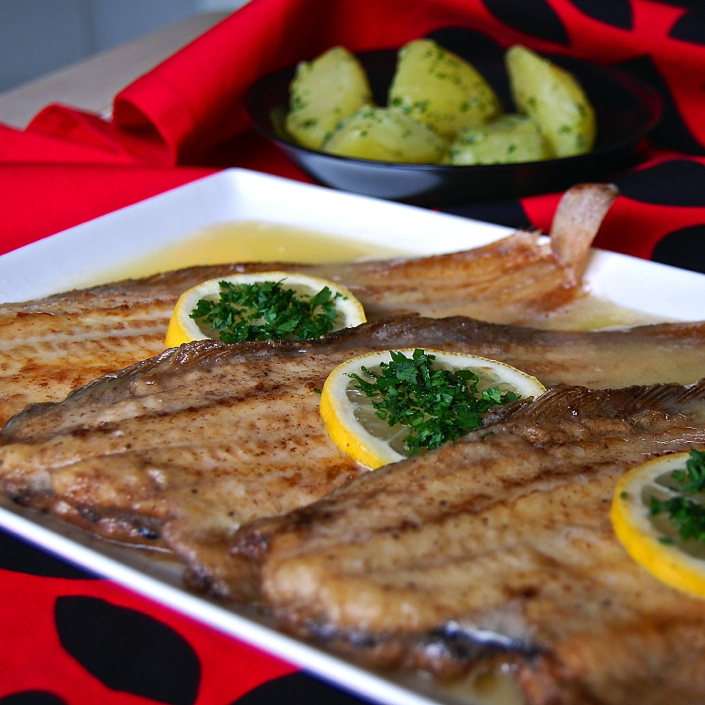 Ingredients for 4 servings: To cook the fish ==> 4 Soles, salt and black ground pepper to fit your taste, flour, 100 grs of butter and 1 table spoon of olive oil. To prepare the sauce ==> 2 fresh lemons, 4 springs of fresh parsley and 75 grs of butter. To cook the potatoes ==> 8 small potatoes, salt and black ground pepper to fit your taste, 1 spoon table of butter and 1 spoon table of olive oil. Wash under tap water, dry and salt/pepper it and coat in flour. Heat a big sauce pan with the butter and olive oil. When hot, add the Sole coated in flour. Fry for 3 minutes each side at medium heat. (Depending on the size of the fish it might take a bit longer or shorter). When cooked, place over kitchen paper and reserve. Squeeze 1 1/2 lemons and reserve the juice. Cut the other half in slices and reserve for the decoration of the dish. Wash and dry the fresh parsley and chop it. Reserve. In a small pot prepare the sauce. Heat the 75 grs of butter at medium heat, add the lemon juice and stir with a wooden spoon until you bind the sauce. Reserve. 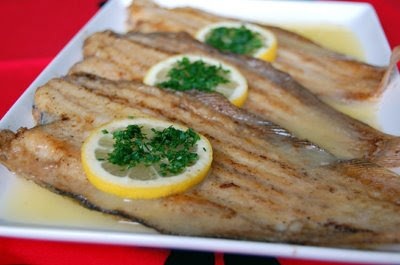 Prepare the plate: Place the Soles, pour the sauce on top, place the lemon slices and sprinkle with some of the parsley. Reserve inside the oven with low heat to keep the dish warm. Peel your potatoes and boil them. When cooked (aprox 20 minutes), strain and place in a pan with one spoon table of olive oil and one of butter, golden the potatoes and then sprinkle with the rest of the parsley, salt and pepper. Have your sole with these potatoes. Chiquitita romantica! Con americano chico Ricardo! Si! Oh your stories always bring a smile to my face Nuria! You have such a sweet way of telling them….I agree about Paris being the city of amour.I also adore your fish recipe…a great entry! This looks really delicious. I always love reading your posts. :) Happy belated birthday. I hope you enjoyed it! I love this dish, and I loved your post! And I love Paris and I, too, have some secrets there. ;-) It is, indeed, the city of love. Hola Peter :D. Don’t you have any secrets in Paris? No romantic stories there? Sure you do!!!!! What nice memories you have of France and what a beautiful dish you prepared! They look so elegant — and that sauce, that sauce! Ladle on more sauce for me, my friend! Great stories. I’ve only been to Paris once, but I had a great time and hope to return someday soon! And of course the best part of my trip was the food. My dream vacation is to take 2 months and drive starting from Portugal up through Spain, over to France and then down through Italy. Someday…. I have not been to Paris, but I am enjoying our virtual food tour! This recipe looks delicious and healthy!!! Looks really delicious! I love this dish, so simple, buttery and full of flavours. What a wonderful way to explore the world–bite by bite. I was in Paris 13 years ago… early June, it was great… This looks so good! Parfait Nuria! It is a great classic recipe anda lovely way to travel to Paris. What a great city indeed, amour or not.. I haven’t been to France. I’d love to go there someday. And those fish, boy I can live with it!! ahhh Richard and the city of love, tell more! i want more secrets! ah Paris, elle me manque beaucoup!!! hmm perhaps i fell in love there too, shall i say his name?! oh so sad that i haven’t been commenting lately—school/job have been nightmare. but your french fishies are oh so so lovely! The fish looks good, too! I miss going down to the Olympic village for fish in summer – touristy, I know, but fun! Julia Child’s first meal in France, and my favorite too. Lovely post. Nuria, excellent photos…you captured this French classic wonderfully. I’ve been to Paris three times, adrenalin, amour, Absinthe and art! Hola Nuria. This looks so good and so easy to make. I’ve yet made a dish from Joans’ world travel event. I(actually Monaco) need to though. I went to France just two years ago and working on going back at the end of March! I can’t wait to dig into all that wonderful food! god i love paris. love it. i so want to return. 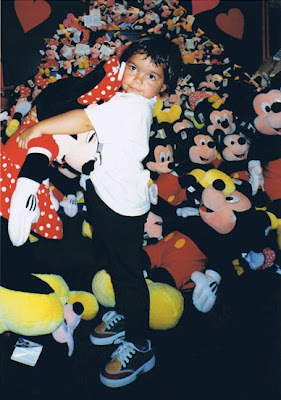 your daughter looks SO freaking cute when she was 3. oh my god… those eyes! Your daughter is so sweet!! And since you’re offering champagne, of COURSE I’d love to have the sole too! I adore french food! Come by my blog, I have awards for you. 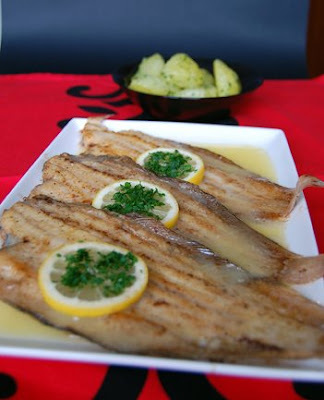 I think that sole is the only fish I would cook with butter it really makes it delicious. I haven’t made it for years. I miss Paris. It has been far to long since I went to school here. And this dish is one of the best clasics ever. I was just thinking about the sauce for this last night. < Lobsters Kitchen Outing and 3 Sauces.